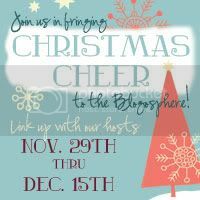 As of last night, I think I was the only blogger who hadn’t decorated for Christmas yet. Honestly, I’m having a hard time getting into the spirit. I blame it on living in Phoenix – it’s hard to feel Christmas-y when you’re wearing shorts and flip flops through the end of November, especially when you are originally from a place with four seasons. 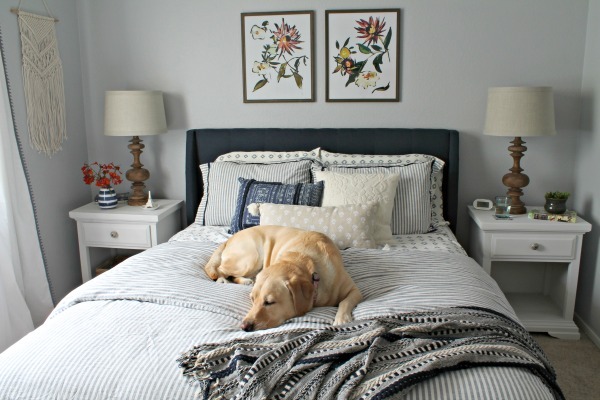 Oh, and I don’t have kids to decorate for…just a puppy. 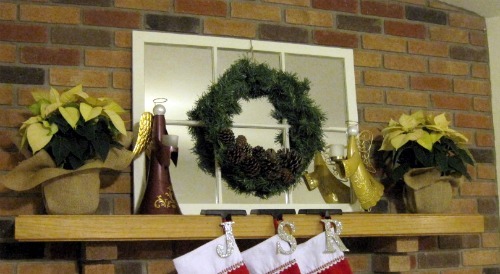 Anyway, last night I finally put on my big girl pants and started decorating – starting with my mantle. It’s pretty simple and natural for me. My Christmas decorating style is usually red, green and all things cheesy. And honestly, I’m stilling thinking of mixing it up and going more bright and fun. I blame it on Wal-Mart for not having any more small red poinsettias - I was forced to go neutral. And for those of you wondering – Yes, I have thought about poinsettias possibly being poisonous. I’ve heard it both ways, but I’m paranoid so I’ll be eagle-eyeing for any fallen petals or leaves. Speaking of Ringo, he even got his own stocking. I’m planning to buy nice stockings and stocking holders for us once they are on after-Christmas-clearance, but for now I love these cheap stockings and glitter letters. The angel candleholders are from after-Christmas-clearance a couple years ago. I think I nabbed them for 90% off at Wal-Mart. And the wreath was bought last year from after-Christmas-clearance as well. I just hot glued a few pinecones on it. 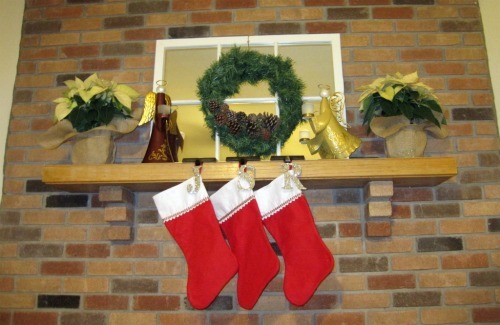 So there’s our natural neutral (except the stockings) Christmas mantle. 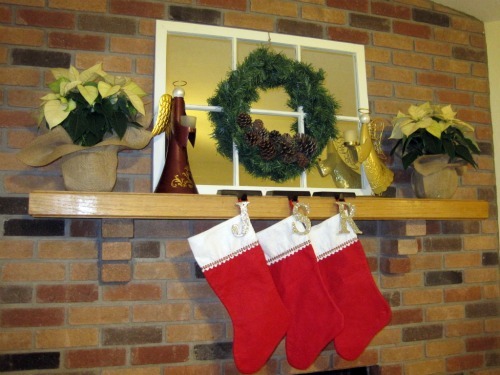 Has anyone else not finished their Christmas decorating? Or is it just me? 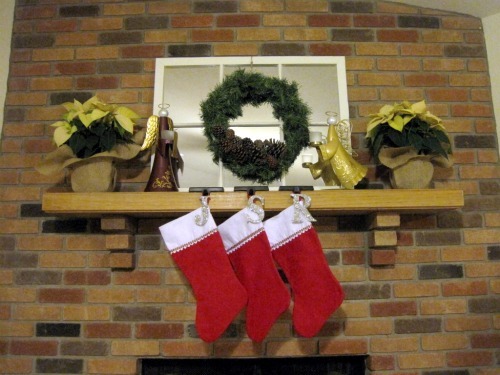 The mantel looks lovely, the stockings are a simple classic! I'm no where near finished decorating for Christmas, and they my kids keep tackling the tree, not sure I ever will be! After Christmas sales are the best for stocking up! I'm in Houston and I agree, it is so hard to get festive when it's still a million degrees outside! 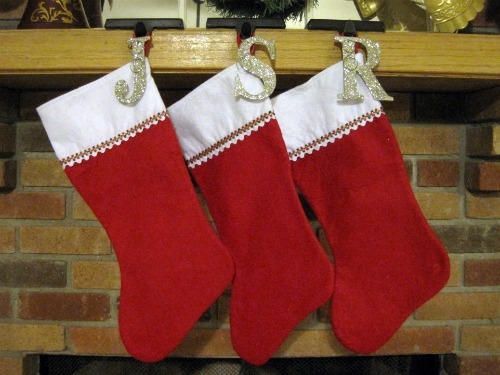 I love how you put the glittered letter on each stocking! I LOVE THIS!!! 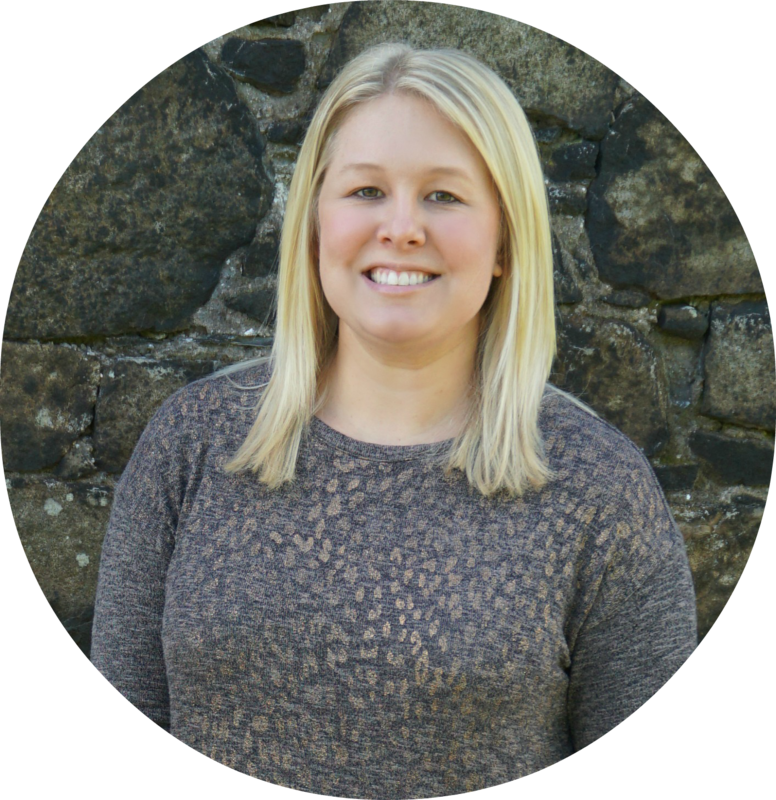 the glittery initials are FAB! !